It’s not just a good third jersey – it’s probably better than the Senators’ primary jerseys too, which, as we all know, are the only NHL jersey to prominently feature gold sparkles. 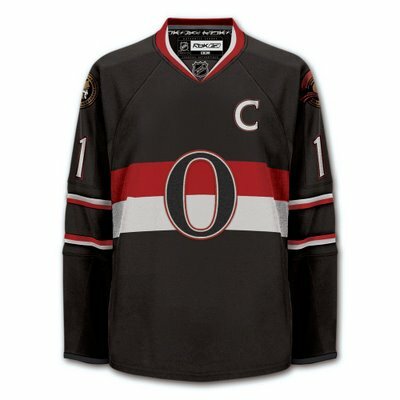 There are admittedly some concerns, most of which revolve around the fact that the O looks like a zero, but I’ll take something that’s true (last I checked the Sens actually haven’t won a cup in the modern era) over some concept sweater that’s not just horrible in its own right, but broadly indicative of horrible, high-concept trends in jersey design that somehow exist when about 99% of people will site any original six jersey as a thing of true beauty. This is where Steve, also a thing of true beauty, comes in. That’s a nice compromise. I’m a big fan of the ‘O’ jersey, though I admit there’s the whole ‘zero’ aspect to it. I especially like the way you’ve gotten the white lines on the torso striping to merge with the outline of the senators logo. I also agree that the team should return to the old, vaguely-Chinese looking Senator rather than the three-dimensional, cartoon guy. Lastly, I like the lack of striping along the bottom. 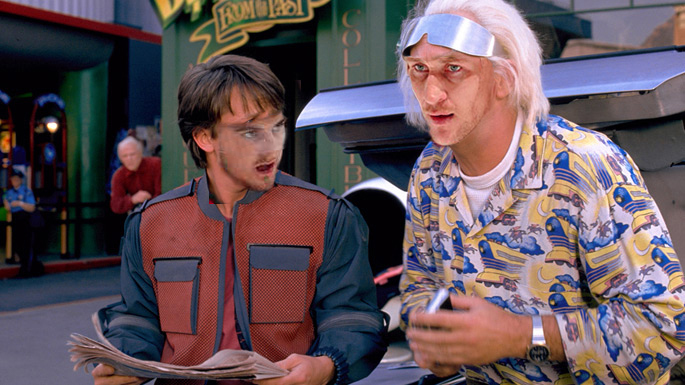 It’s only a matter of time before they adopt something very similar to this, I think. 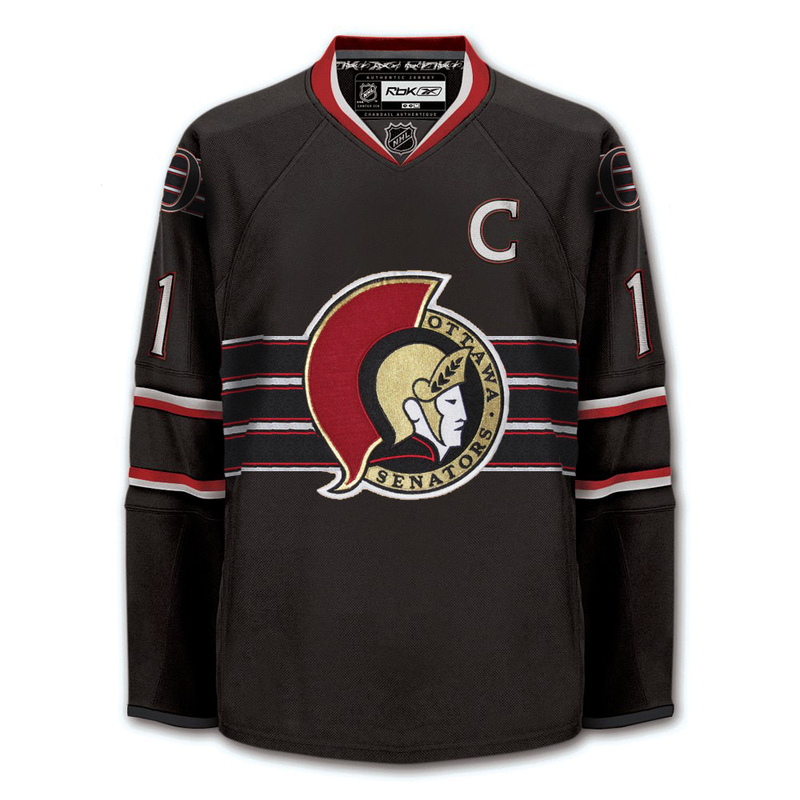 Then again, the black SNES jersey sort of came out of nowhere. What do you think of the draw string? I’ve never been a fan, because I think it complicates the nice clean design, but people are nuts about it. I don’t like the draw strings and I don’t think that the players do either. Most of them take them out to play. The only exception to the rule, in my mind, is original six teams. I feel like it’s a reasonable modification to a jersey that can’t be improved upon (The Canadians, Bruins, the Rangers and most of all The D-troit Redwings [conceptually, the best logo design ever]) Also historically accurate for teams that where around when jerseys were made of wool and good intentions. I personally think that less is more. The ‘O’ jersey is a perfect example. I’m crazy about that design and I’m even crazier about the fact that it’s a fan design. I think that Buffalo returning to the “literal” logo is a great sign that we’ve reached the tipping point for ludicrous team iconography (although the Atlanta Thrashers will always be the exception to the rule.) I could also do without the NHL logo on all the jersey throats. I couldn’t tell you why though. An original six team design that sticks a letter on the front or a literal representation of the team name and tries to keep the design clean from there. If those are our options, I’ll take the last one. An O and a clean design. Or a Senator. Done. After all, things could be worse. WAY worse. This entry was posted in Picture of the Dayish, Verbosity by Varada. Bookmark the permalink. Viva Side Profile Sen!!!!! The first design kinda looks like the polish flag across the chest. Not sayin, just sayin. Steve’s is much better. I was at the game when the current third jersey was unveiled, and I walked in during the national anthem. I was up in the 300s, so I couldn’t see the front of the jersey, but I loved the colour from the back. I remember saying to myself – if they turn around and there’s a big “O” on the front like the old days, I’m going straight to the store to buy it. Needless to say, they turned around and I saw the huge “SENS” and was horribly disappointed. It’s like the Habs having a third jersey that says “Habs” on it – real classy!